Google Wallet and iOS's Passbook have helped reduce the number of loyalty, debit, and credit cards we need to carry around every day. But they haven't eliminated them altogether. 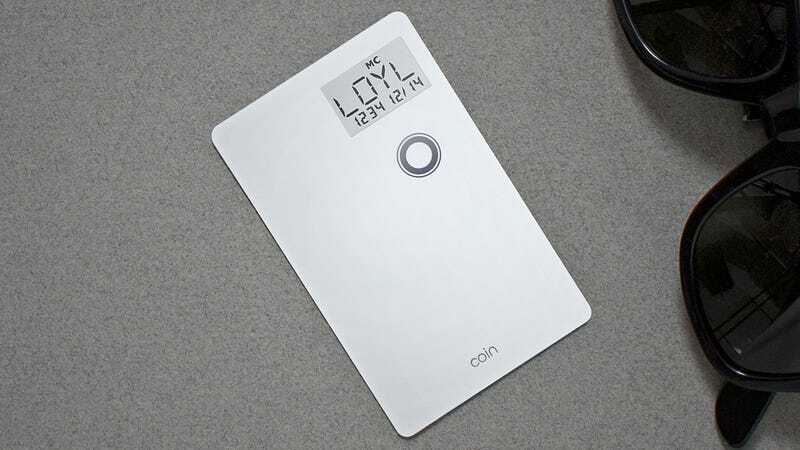 The creators of Coin want to further slim your wallet with a multi-function card designed to emulate and replace the debit and credit cards you still need to carry. Roughly the size of a standard credit card, the Bluetooth-connected Coin features a small integrated black and white e-ink display, a single mode button, a two-year battery, and a magnetic stripe that can pretend to be any swappable card in your wallet. Using an iOS or Android App and an included compact dongle, users can swipe multiple debit, credit, even gift cards and then upload those account details onto the Coin. And with the card's single mode button and basic display, they can then toggle through which payment card they'd like to use, and then swipe it through a store's standard card reader. A low-energy Bluetooth connection to a smartphone not only allows users to manage which cards the Coin can emulate, but it also provides a bit of extra security. If you accidentally forget the card somewhere or it's stolen, you'll be notified on your phone that the Bluetooth connection has been lost, and the Coin will automatically deactivate itself. On top of that, all wireless communications between the card and your phone are protected with 128-bit encryption to prevent someone from intercepting your account details.